A spokesman for Mel Gibson said "Mr. Gibson hopes that by making this public sacrifice, Mr. Gibson will be recognized by the world community as having exhibited true contrition and will be able to put this thing behind him in time to make Lethal Messiah III, expected to be a major summer blockbuster." Mel Gibson, who reportedly suffers from chronic alcoholism and Messianic delusions, has come under fire repeatedly for making generally guarded anti-Semitic statements both on-screen and off. During a drunken altercation with a police officer last year, however, Mr. Gibson reportedly let fly a barrage of expletive-ridden hate speech during which he blamed Jews for virtually every unfortunate world circumstance including global warming, a low sperm count, the untimely hairlessness of his favorite Schnauzer Rudolf, and the threat of Asteroid Apophis. In the ensuing storm of criticism Mr. Gibson lost several key upcoming film and television contracts, blaming the loss of the contracts on "a bunch of greedy Jews". "All of that is now firmly behind Mr. Gibson," Mr. Gibson's spokesman said. "Mr. Gibson realizes the error of his ways, and will now atone for what he recognizes as his antisocial behavior by legally changing his name from Mel Gibson in a symbolic act of spiritual and moral rebirth." According to Mel Gibson's spokesman, Mr. Gibson, in consultation with advisors, media attorneys and focus groups, considered a large number of possible alternative screen names, finally settling on the catchy, familiar-sounding "Mel Gibson" after it was determined that it met the broadest range of key criteria. "We found that the name 'Mel Gibson' carried the widest brand recognition, both positive and negative, among our focus group samples," Mr. Gibson's spokesman said. "And as we in the media business know well, there's no such thing as bad publicity. A brand is a brand. 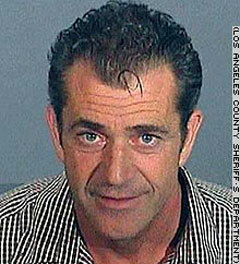 Mel Gibson will therefore be going with the new screen name 'Mel Gibson'." Reached by telephone at his vacation home in Eastpointe, Michigan, Mr. Gibson said he "hopes the world will accept his act of contrition" and that he "expects the legal name change from 'Mel Gibson' to 'Mel Gibson' to be processed within the next few weeks, if those lazy Jews in the government ever get their scrawny asses in gear."